Shane McMahon and Daniel Bryan are seen watching what happened on last week’s Smackdown. James Ellsworth inadvertently cost Dean Ambrose a shot at the WWE Intercontinental Championship. Ellsworth is seen standing with them sneezing away and eventually sneezes on them. They mention that he’s not healthy enough to compete tonight and send him home. Ellsworth’s championship opportunity is postponed. The Miz and Maryse are in the ring for another edition of Miz TV. The crowd loudly boos them while Miz welcomes the crowd to the show. This is day 28 of his Intercontinental Championship Reunion Tour. Miz TV is a star-studded event if for no other reason than it has his lovely wife and himself. Tonight is special because they are bringing two of the most powerful champions WWE has to offer. His guest is the WWE World Champion, AJ Styles. AJ Styles makes his way to the ring to a nice reception. Styles is no longer in a walking boot. An “AJ Styles” chant fires up. Miz asks the crowd if he can start. Miz asks about James Ellsworth not being able to compete. Styles says he has “chin-fluenza.” They did Ellsworth a favor, but sooner or later he’ll destroy him right in the middle of this ring. Miz asks how he can sleep at night knowing that he has to defend his title against James Ellsworth anytime and anywhere. Styles thinks about that for a moment before bursting out in laughter. Styles says Miz is funnier than he’s given credit for. Miz says his hair is nicer than a soccer mom’s. Styles talks about wanting a conditioner endorsement. Miz asks what’s next for Styles. Styles says Shane McMahon and Daniel Bryan are probably asking themselves the same thing. He beat John Cena and Dean Ambrose. He’s going to destroy James Ellsworth. Who else is there? He’s the face that runs the place and the champ that runs the camp. He’s the most prestigious champion on Smackdown Live. Miz says he’s the greatest champion and the longest reigning champion on Smackdown Live. Only one person in this ring has brought their title from obscurity to new heights of glory. The WWE Championship is prestigious, but he’s taken the Intercontinental Championship and made it legendary. Styles has never beaten Ellsworth and battled Ambrose for months. He beat Ambrose last week. Styles asks for his point. Miz says Styles mentioned that nobody is on his level. Miz says he’s not on Styles’ level — he’s above it. They get up and stand face-to-face. Miz says it may be time for him to make the WWE Championship legendary. Miz throws the microphone down and puts his title to the side. They prepare to fight. Dean Ambrose’s music hits, and he powers his way down to the ring. Miz and Styles stand on the apron. Dolph Ziggler’s music hits, and he makes his way down to the ring as well. Ziggler calls them paper champions talking a lot of game. Neither can win a match without cheating. If Miz didn’t have Maryse’s skirt to hide behind, he could hide behind Styles’. Miz gets in the ring and starts fighting with Ziggler before giving him a Skull Crushing Finale. Ambrose then drops Miz with Dirty Deeds. Styles watches from ringside starting to walk off. Ambrose then drops Ziggler with Dirty Deeds. All of a sudden, The Wyatt Family video flashes on the screen and the screen goes black. When it comes back on, Luke Harper is in the ring, and he drops Ambrose with a spinning clothesline. Harper then points at Styles. Tonight, we’ll see a tag team battle royal to determine the number one contenders for the Smackdown Tag Team Titles. Coming up next, we’ll see Natalya take on Carmella. Shane McMahon and Daniel Bryan are talking backstage when AJ Styles walks up to them. Styles demands to have protection because he’s the champ. McMahon says the WWE Championship match with James Ellsworth was postponed, but they did some thinking. Bryan says tonight Dean Ambrose, Dolph Ziggler, The Miz, and Luke Harper will compete in a Fatal Four-Way Elimination Match. If anyone interferes like Maryse or The Wyatt Family, that will cause an elimination. McMahon says the winner will face Styles for the WWE Championship on the December 27th edition of Smackdown Live, the last show of the year. Styles cannot believe this is what they think protection is. Nikki Bella will be the guest commentator on the next match. Natalya grabs a microphone and says she wants to take a moment to publicly tell Nikki that she didn’t attack her. She didn’t want to do it like this, but Nikki won’t take her calls or respond to her texts. She needs to do this before Carmella comes out and starts spreading lies. Carmella’s music hits to cut her off. The bell rings, and Natalya quickly takes Carmella down before punching away at her. Carmella quickly gets in the ring, but Natalya quickly retrieves her. Natalya takes her down and continues punching away at her. The referee pulls Natalya off before Carmella gets out of the ring. Natalya tries to pull her into the ring, but Carmella slaps her in the face. Carmella takes her down and punches away at her. We come back from the break to see Natalya slap Carmella and give her a snap suplex. Natalya calls her a liar and slaps her again before giving her another snap suplex. Natalya powers her to the corner and knees away at her. Natalya punches away at her and yells at Nikki that she didn’t do it. Carmella comes back with a hurricanrana and a clothesline for a two count. Carmella talks trash and stomps away at her before doing a moonwalk. Carmella gives her a bronco buster for a two count. Carmella applies a body scissor and talks some trash. Natalya eventually turns over and punches away at her. This leads to Carmella applying a guillotine choke, but Natalya fights up and gives her a Michinoku Driver. Natalya tries for the Sharpshooter, but Carmella kicks her away and gets out of the ring. Natalya takes her down with a baseball slide and goes over to Nikki to plead her case. Natalya pushes Nikki out of the way and forearms Carmella. Natalya puts her in the ring and says to Nikki that she didn’t do anything wrong. Carmella catches her with an inside cradle for the win. Nikki Bella walks off on Natalya, who is not happy with her loss to Carmella. Later tonight, we’ll see a tag team battle royal to determine the number one contenders for the Smackdown Tag Team Championships. The WWE Network has surpassed 7,000 hours of content. A video recaps John Cena’s appearance on Saturday Night Live. Cena will return to Smackdown Live in two weeks. Gabriel Iglasias (?) walks up to Apollo Crews and talks about being on Tribute to the Troops. The Miz and Maryse walk up and make fun of him. Crews and the guy make jokes at Miz’ expense, and he does a fake laugh. Miz almost calls the guy a “piece of sh–” but Crews cuts him off. They walk off on them. The #1 Contender’s Battle Royal is next. The bell rings, and Mojo Rawley immediately clotheslines Simon Gotch over the top rope. Both tag team partners must be eliminated for the team to be out. Aiden English is on his own. Slater and Rhyno try to eliminate Fandango, but he fights them off. It’s a massive brawl in the early stages. Rawley attacks Jordan and Gable before they eliminate Ryder. The Ascension nearly eliminates Slater. Rawley drops English on the apron, but he stays in. Viktor stomps away at Slater. Ryder is trying to dump Breeze over the top rope, but Fandango puts a stop to that. Breezango give Ryder a wishbone split. Slater dropkicks English in the corner. On the other side of the ring, Gable gives Viktor an over the top rope arm bar before eliminating him. Konnor then eliminates Gable. Jason Jordan and Konnor are on their own. Slater accidentally knocks Rhyno off the apron, eliminating him. Rhyno is not happy. No teams have been completely eliminated yet. We come back from the break to see the brawl continuing. The commentators completely miss Fandango eliminating Rawley. Jordan drops English on the apron. English pulls him onto the apron. Jordan then gives English a flapjack to the floor, eliminating The Vaudevillains for good. Slater drops Fandango on the apron, but he’s soon pulled out. They duke it out on the apron before Slater eliminates him. Breeze is still in the match. Breeze, Slater, Jordan, Konnor, and Ryder are still in the ring. Jordan hits everyone with shoulder thrusts in the corner. Jordan gives Slater an exploder suplex before giving Ryder a belly-to-belly overhead suplex. Jordan goes for a leg capture suplex on Breeze, but Konnor cuts him off. Konnor and Breeze combine to eliminate Jordan. American Alpha is out of this. The Ascension, The Hype Bros, Breezango, and Heath Slater and Rhyno still have representatives in this match. Breeze and Konnor form an alliance to attack the other two. Slater fights them off and cleans house. Konnor eventually throws Slater onto the apron. Slater fights to stay alive in the match and gets in the ring. Konnor then viciously eliminates Slater. Breeze kicks Ryder in the face before Konnor clotheslines him down. Konnor and Breeze continue their temporary alliance by working over Ryder. Breeze went to eliminate Konnor, but he can’t move him. Konnor knocks Breeze to the apron and evntually eliminates him. Konnor gets Ryder up for a powerbomb and nearly kills him. Ryder then gives him a hurricanrana over the top rope. The Hype Bros will challenge The Wyatt Family for the Smackdown Tag Team Titles. Tonight’s main event will see a Fatal Four-Way Elimination Match with Dean Ambrose, The Miz, Dolph Ziggler, and Luke Harper. The winner faces AJ Styles for the WWE Championship on December 27. Alexa Bliss is in action, next. A Baron Corbin hype video airs. Alexa Bliss grabs the microphone from the ring announcer and kicks him out of the ring. Bliss warns the timekeeper not to win the bell. She gets that everyone is in the holiday spirit and Smackdown Live is the land of opportunity, but unlike Becky Lynch, she doesn’t do charity cases. She motions to the unknown female competitor in the ring. She asks if she’s Jane Ellsworth. The woman approaches Bliss. Bliss says it’s nothing personal. It’s just — Bliss punches her in the face and kicks her out of the ring. Becky Lynch’s music hits, and she makes her way to the ring. Lynch says she was terribly rude last week and apologizes for catching her off guard when she asked for her rematch. Now she is in her ring gear… and she is as well! Lynch gets in the ring and asks for her rematch right now. The crowd pops for that. Bliss tells them to shut up because the champ has something to say. Bliss says she’s got her match… just not tonight. Bliss quickly leaves the ring. Bliss says it’ll be on her terms. Shane McMahon’s music hits, and he comes out to the stage to a big reception. McMahon plays to the crowd. McMahon says this isn’t how we roll on Smackdown Live. Bliss has a championship rematch against Becky Lynch. The timekeeper can ring the bell because the match is next! Bliss flips out. Charles Robinson, the best ever, is the official for this match. Bliss quickly gets to the ropes at the sound of the bell. They lock up, and Lynch quickly goes for the Dis-Arm-Her, but Bliss gets to the bottom rope. Bliss kicks her, but Lynch quickly takes her down twice before covering for a two count. Bliss takes her down, but Lynch applies a side headlock. Bliss rolls her up for a two count. Lynch applies a hammerlock, but Bliss elbows her in the face. Bliss hits the ropes, but Lynch connects with an arm drag. Bliss sidesteps an avalanche, but Lynch soon comes back with a kick to the midsection. Lynch goes for a scoop slam, but Bliss gets out and kicks her down for a two count. Bliss stands on her before going for double knees, but Lynch moves and rolls her up for a two count. Bliss viciously slaps her and hits the ropes, but Lynch follows her and hits a pair of clothesline. Lynch connects with a leg lariat before hitting a forearm in the corner. Bliss goes for an exploder, but Bliss counters out. Lynch goes for the Dis-Arm-Her, but Bliss gets to the bottom rope. Bliss leaves the ring. They brawl at ringside before Lynch forearms her down on the floor. Lynch gets her in the ring, but Bliss quickly runs out on the other side. Bliss acts like she tweaked her knee. The referee counts her out and for whatever reason, Lynch doesn’t get out of the ring to grab her like she did moments before. Becky Lynch attacks her at ringside and puts her in the ring. Alexa Bliss’ knee all of a sudden is fine, showing she faked it. Bliss viciously stomps her before Lynch makes a comeback. Bliss quickly escapes the ring and runs up the ramp. Coming up next, we’ll see a Fatal 4-Way Elimination Match to determine the #1 Contender for the WWE Championship. John Cena returns in two weeks. A video highlights Randy Orton’s appearance on “Shooter,” immediately following this show. Everyone in the Fatal 4-Way makes their entrance. The match starts next. AJ Styles will be on commentary for the next match. The bell rings, and Harper quickly dropkicks Ambrose down before giving Ziggler a flapjack. Harper knocks Ambrose off the apron and uppercuts Ziggler. Miz looks frightened. Harper then wipes Ambrose out with a suicide dive. Harper gets in the ring and stares at The Miz. Miz claps for him and gives him props. Miz tries to form an alliance and goes for a handshake, but Harper uppercuts him down. Harper connects with a Michinoku Driver for a two count. Miz rolls out of the ring to recover. Harper fights off Ambrose and Ziggler before they take him down with dropkicks. Ambrose and Ziggler then clothesline him out of the ring. Ambrose clotheslines Ziggler down before Miz pulls the top rope down to get him out of the ring. Ziggler rolls Miz up for a two count. Miz quickly gives him a DDT for a near fall. Miz baseball slides Ambrose and Harper. Miz mocks the “YES” taunt and starts kicking Ziggler in the chest like Daniel Bryan did. Ziggler avoids a big kick and tries for a DDT, but Miz pushes him off and dropkicks him in the corner. Miz hits a second one before Ambrose gives him a running forearm and a bulldog. Ambrose goes for a suicide dive on Harper, but he pushes him off. Ambrose goes for a rebound clothesline, but Harper viciously big boots him on the floor. Harper gets in the ring, and Ziggler rolls him up for a two count. Harper gives him a backbreaker before chopping him in the corner. Harper stares at Styles before going back to Ziggler. Harper uppercuts him before connecting with a guillotine catapult for a near fall. Harper uppercuts Ziggler in the corner before whipping him hard into the opposite corner. Harper goes outside and sends Ambrose into the barricade. Harper turns him attention to The Miz, who quickly scurries away. Harper gets in the ring and applies a torture rack on Ziggler. Ambrose goes for Dirty Deeds, but Ziggler superkicks him. Harper hits Ziggler with a Discus Clothesline, and Ambrose hits Harper with a Lunatic Lariat. Miz comes in and covers Ziggler for a near fall. Miz covers Harper for the same result. Miz yells at the referee before Ambrose catches him with a small package to eliminate him. The Miz has been eliminated from the match. The Miz flips out over his elimination. Miz yells at the referee. It’s down to three men now. We come back from the break to see Ambrose hit Ziggler with a fisherman’s suplex for a near fall. Ambrose chops him a few times before Ziggler goes for a running cross-body, but he’s caught. Ambrose hits a swinging backbreaker for a near fall. Ambrose applies an STF, but Ziggler rips at the face to get out of the hold. Ambrose hits a snap suplex for a two count. Ambrose goes to the top rope. Ziggler tries for a super X-Factor, but Harper runs up and gets him in electric chair position. Ziggler gets down and gives Harper a Zig-Zag. Ambrose then wipes Ziggler out with a flying elbow and picks up a near fall. Ambrose sends him into the ropes, but Ziggler comes back with a sunset flip for a two count. They trade pins before wiping out each other with double cross-body blocks. Harper attacks both men and drops Ambrose with a swinging sidewalk slam for a near fall. Harper annihilates Ziggler with a sit-out powerbomb, but he somehow kicks out. Harper is furious. Harper hits running elbows on Ambrose and Ziggler in the corner. Harper puts Ambrose on the top rope before running into a superkick from Ziggler. Ambrose drops Harper with Dirty Deeds to eliminate him. 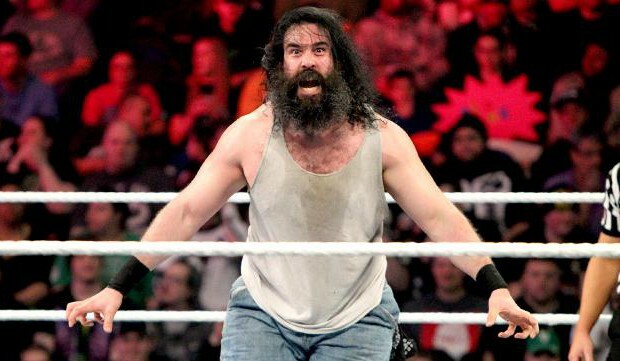 Luke Harper has been eliminated. It’s down to Ambrose and Ziggler. Ziggler connects with a pair of clotheslines and a splash in the corner. Ambrose catches him with a neckbreaker before going for an elbow drop, but Ambrose moves. Ambrose gets on the apron. Ziggler grabs him and goes out to the apron. Ambrose takes him down and hits a catapult into the ring post. Ambrose powers him back into the ring and goes to the top rope. Ziggler pops up and hits a super X-Factor. Ziggler takes a few moments before going for a cover, but Ambrose counters into a small package for a near fall. They then take one another out with a double clothesline. The Miz runs in through the crowd and stares at Ziggler. Ziggler lunges at him, but Miz moves. Ziggler goes outside the ring and challenges him. Ambrose hits Miz with a suicide dive before Ziggler superkicks him down. Ambrose sends Ziggler headfirst into the ring post and puts him in the ring. Ambrose goes to get in the ring, but Miz grabs his foot. Ambrose sends him into the barricade. Ambrose gets in the ring, and Ziggler superkicks him for the win. Dolph Ziggler will face AJ Styles for the WWE Championship on December 27, the final Smackdown Live of the year. Rich Swann is shown backstage. Swann talks about taking on TJ Perkins. TJP can’t handle this. WWE 205 Live is after Smackdown Live.